German unit: 1./1716 A.R. – 716. Inf. Div. 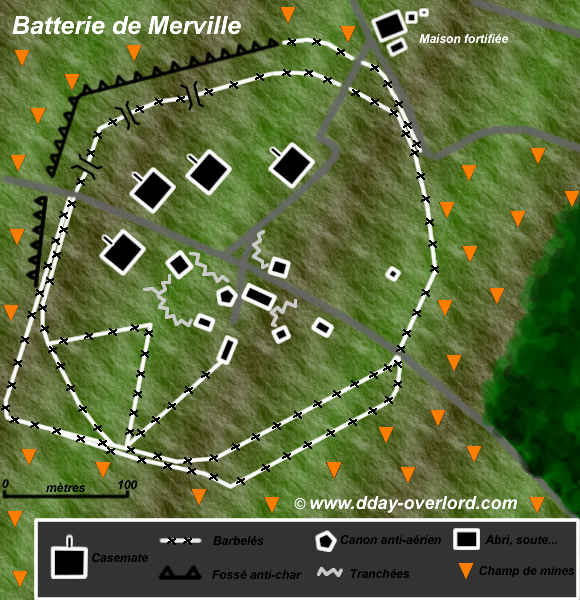 In the locality of Merville, near Franceville in the Calvados region, there is a battery of the German army, composed of several shelters and defense posts, anti-tank ditches, hundreds of meters of barbed wire, minefields and above all four casemates protecting artillery guns. According to the aerial photographs made during the preparation of Operation Overlord, the Allies considered that such casemates could protect 150 mm artillery guns. Such guns were able to crush Sword Beach sector under their fire. For the Allies, this military site, reinforced by a group of different observation and support bunkers located west of Franceville, had to be imperatively under control before the British and French soldiers begin landing on D-Day. Throughout the spring of 1944, the Allies bombarded Merville’s battery hoping this would avoid a ground attack, but the bombs had no effect on the German two-meter-thick bunkers covered with sand and clay. However, on May 19, 1944, Hauptmann (captain) Wolter was killed in a raid by the Royal Air Force: he was replaced by Oberleutnant (lieutenant) Raimund Steiner. The German garrison of Merville’s battery under Steiner’s orders was made up of 160 soldiers (80 artillerymen belonging to the first battery of 1716. Artillery Regiment and 50 sappers). On 6 March 1944, exactly three months before the landing, Feldmarschall Rommel visited the site and ordered the acceleration of the work which ended in May 1944: in addition to the casemates, the battery included a 20 mm anti-aircraft gun, fifteen machine-gun positions, a 91-meter wide minefield, an anti-tank ditch and a 1.5-meter-wide, 4.6-meter high barbed wire. 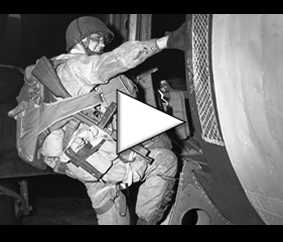 General Eisenhower’s staff took the following decision: a British parachutist commando will silence the battery on the night of D-Day a few hours before the landing on the beaches. Lieutenant-Colonel Terence Otway will be the commander of this 700-strong commando, belonging to the 9th Parachute Battalion of the 6th Airborne Division. Aware of the difficulty of this mission and the high likelihood that officers in charge will be killed before or during the assault, he asked his subordinates to understand the smallest details of the mission. During the months leading up to D-Day, British airborne and glider troops continually performed parachuting (day and night) and the battery complex was even fully rebuilt in England at Walbury Hill according to aerial photographs. 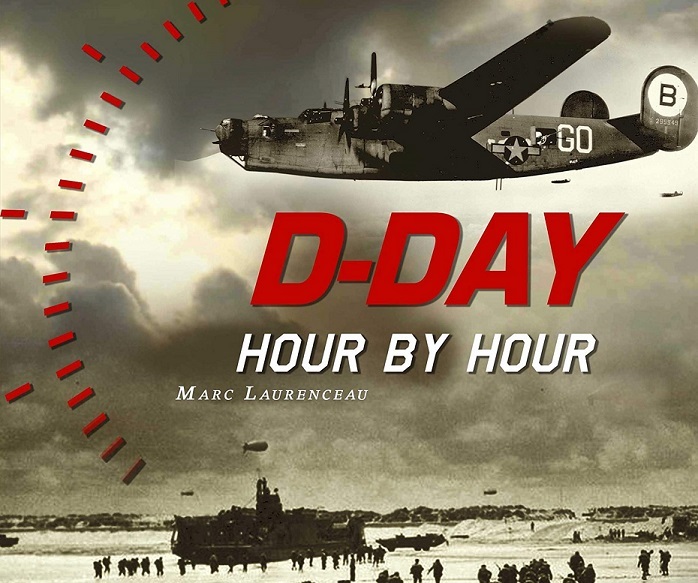 Shortly before one o’clock in the morning of Tuesday, June 6, 1944, pathfinders led by Major George Smith jumped over Normandy and reached their rendezvous points, while Lancaster bombers launched an important raid on the battery. However, the Eureka radio transmitter were mostly damaged during the jump and pathfinders were unable to communicate with the C-47s in charge of parachuting the 9th Para Battalion. In addition, smoke from the bombardment was hiding all visibility for pilots who could not clearly detect the drop zone. Nevertheless, as of one o’clock in the morning, 600 British paratroopers were dropped over Normandy, on the drop zone V between Varaville and the battery. In spite of a thorough training, the operation did not take place as at the exercise: like their American comrades, the British were victims of a large dispersion once in the ground. Wind and severe drop-off errors disrupted considerably the established plans. At night, some glider and C-47 pilots have confused the Dives and the Orne rivers. Lands flooded by the Germans in Normandy did not help this situation, and the paratroopers had virtually no point of reference to orient themselves. The same applied to the Horsa gliders, carrying heavy machine guns, Jeep vehicles, mine detectors, mortars, anti-tank guns and medical support units. Otway was parachuted more than 370 meters from his planned drop-off point in a farmhouse used as a command post by the Germans: after a quick skirmish he managed to reach his rallying point at 01:30. He deplored the losses of men and equipment well above the most pessimistic estimates: at 2:50 in the morning, only 150 men out of 600 engaged were at the right location. Others were lost in the Normandy countryside, some were wounded or drowned in the marshes. Some took more than four hours to complete a distance of one kilometer and a half without meeting any comrades. Lieutenant-Colonel Otway did not have one single jeep, only one Vickers heavy machine gun and some bangalore torpedoes. The operation was a failure before it even reached the objective. Despite this reduced staff, he decides to do everything possible to accomplish his mission. He must absolutely take the battery because he knows that this success depends on the survival of British and French infantrymen who are scheduled to land on Sword Beach a few hours later, as well as allied sailors aboard the warships on the Handle. Shortly after 4 o’clock in the morning, he reached the village of Gonneville-sur-Merville in the south-east of the battery where he found a dozen scouts and sappers (Major Smith) who discreetly practiced four breaches Hand through the barbed wire and minefields that encircle the complex. However, he notes with concern that the bombing carried out shortly before by the hundred four-engine Lancaster failed: the battery is almost intact. Moreover, the German defenders are placed on alert following this raid. Faced with this precarious situation, Otway quickly planned his action and divided his troops into four groups: three had to lead the main attack from east to west while another group had to carry out a diversion attack from the north. The onset of the assault was caused by the explosion of bangalore torpedoes (which were supposed to breach through the minefield and barbed wire) and by the Vickers machine gun fire located south-east of the battery. At 04:30 am, three Horsa gliders filled with explosives and fifty soldiers were supposed to land at the very heart of the battery just before the attack to produce an effect of surprise: two aircraft were shot down by the German antiaircraft guns land too far from the battery to support the British assault (one more than three kilometers away, the other near a minefield where the crew had to fight against adverse elements who were to reinforce the Merville complex), while the third landed in England shortly after takeoff, having encountered problems with the tow rope. Lieutenant-colonel Otway immediately launched the attack: the paratroopers engaged a short but violent assault against the hundred Germans who defended themselves with relentlessness. The German heavy machine guns shot down many of the first British parachutists who showed up through the minefield. Because of the aerial bombardments, the armored doors of the casemates were left open by the Germans in order to ventilate the shooting stations: the paratroopers took advantage of this situation to fire their phosphorous grenades. They also used the ventilation pipes into which they threw several grenades. Only four paras arrived at the fourth casemate and seized it, the others being pinned down or busy silencing the rest of the complex. Twenty minutes later, the British managed to capture the battery but they suffered heavy losses (70 British officers and soldiers were killed or wounded). 22 Germans were killed and as many soldiers were made prisoners, while the rest of the garrison managed to escape. Their leader, Lieutenant Steiner, was at the command post on the seaside in Franceville at the moment of the attack: he tried to launch several counter-attacks towards Merville (in particular with a half-track armed with a powerful anti-aircraft gun) but his men were pushed back by the British paratroopers. Unable to seize back his battery, he directed the shots of the second and third batteries of the 1716th artillery regiment in the direction of Merville. British paratroopers discovered that the guns were actually old Czech models of 100 mm (M.14/19 100 mm), far less effective than possible 150 mm guns. Nevertheless, they neutralized the artillery guns before firing flares as a sign of victory to the allied sailors who waited off the coast of Normandy. Although Merville’s battery was in the hands of the Allies a few minutes before the beginning of the Normandy landings, Otway, already short of men, equipment and ammunition, was now amputated by several infantrymen, killed or seriously injured. He then took the direction of his secondary objective, known has the Hameau du Oger (also spelled Hauger or Hoger), a few kilometers south-west of Merville. A German doctor, caring both the wounded of his homeland and the British soldiers, decided to stay with the men who could not be transported. Otway warned him that HMS Arethusa would bombarded the battery at around 5 am and that if he wanted to live, he would better not staying in the vicinity. The sense of duty of the German doctor ordered him to provide the necessary care to the wounded of both sides and to protect them from the bombardment. The British lieutenant-colonel accepted and thanked him, before leaving with his men towards Le Plein. The German doctor was killed by the explosion of a naval shell, while he was on his way to seek medical equipment in one of the casemates. On D-Day, the Germans seized the battery again, abandoned early in the morning by the British, and managed to rehabilitate two of the four Czech cannons. Steiner, who had no visuals from his command post on Sword Beach, was unable to fire accurate shots. However, observers from the 736th Infantry Regiment at La Breche managed to transmit the firing corrections up to that their own position was seized by the British amphibious troops. Merville’s battery was the subject of new battles on June 7, especially following the assaults led by commando N°3, which however failed to seize it. Upon their disengagement, the British commandos were caught under the firing of the guns directed with the reticles of direct fire. Numerous skirmishes followed throughout the battle of Normandy and the Merville battery and village did not fall into the hands of the Allies until the 17th of August in the evening, liberated by the Ox and Bucks of the 6th airborne division at the outbreak of the Paddle operation.